HABIT: Pinkish or purplish white flowers in clusters at branch ends in early spring. Red berries in winter. Vertical unbranching shoots, leggy but distinctive. Soft, delicate red-orange foliage. Regular Nandina is 5 - 8 feet tall, Compact Nandina 3 - 4 feet, ‘Harbour Dwarf’ 1 - 2 feet, and ‘Nana’ 1 -2 feet. Grows in any soil, any location. Drought tolerant. Do not shear or box – ever! Withstands an unbelievable amount of neglect. To lower height of plant, cut the tallest shoots off at ground level. CULTURE: Any soil, anywhere. Drought tolerant. Do not shear or box – ever! Can take an unbelievable amount of neglect. To lower height, cut the tallest shoots off at ground level. USES: Specimen, container, accent, screen, hedge, Oriental gardens, mass or border plant. NOTES: Native to China. Nandinas have a curious negative connotation with many people – probably because they are often seen growing wild around abandoned properties. This just shows how tough they really are. All varieties are good except ‘Nana,’ which looks like a chlorotic basketball all summer. 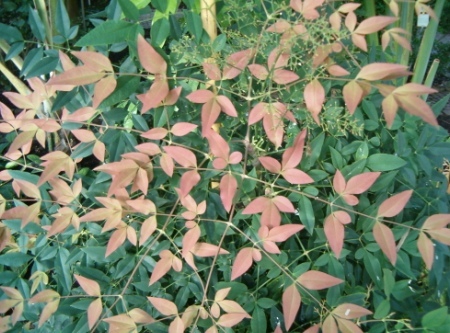 Nandina ‘San Gabriel’ has distinctively thin foliage. Nandinas should be pruned by following the longest shoots to the ground and cutting them off there. This technique effectively lowers the overall height but maintains the natural form of the plants. Shearing or boxing nandinas completely ruins the beauty and injures the health of the plants. It would be okay to do the nandina pruning in the summer but the ideal timing is late winter. Nandina domestica, a non-native, woody invasive evergreen shrub from Eastern Asia has insidiously worked its way into the fabric of the Texas landscape. Introduced in the 1800s, it was widely used as an ornamental landscape plant. It escaped and began invading natural areas. As one comes to understand the havoc this pernicious member of the Barberry family wreaks on our state, both environmentally and economically, Nandina's nicknames, heavenly bamboo and sacred bamboo become more and more ludicrous. As a refresher, let's first define what an invasive species is exactly. A generally accepted definition and one that's used by Executive Order 1311 of the Texas Invasives organization states: "an invasive species is defined as one that is non-native or alien to the ecosystem under consideration and whose introduction causes or is likely to cause economic or environmental harm or harm to human health." Non-domestic Nandina has found a home in Texas because of its ability to thrive in our dry, sunny clime and because it can readily morph, flourishing in shady, moist areas with no care. Nandina's ability to easily adapt and successfully reproduce has led to its promotion as a landscape plant of choice and its perpetuation continues despite myriad data supporting its eradication. Of course there are many other invasive species the likes of Kudzu, China Berry and Ligustrum, but for now my purpose is to explain why Nandina is an un-welcome guest and is included on every invasives species list in our state. Nandina occurs under forest canopies and near forest edges and can inhabit several types of plant communities from upland hardwoods to flood plains and mesic slope woodlands. It is a fast-growing plant that spreads by underground rhizomes (nefarious root-like structures) and seeds. It has a substantial taproot. Seedlings can persist for several years before maturing. Animal-dispersed seeds are broadcast into natural areas where they love to naturalize, displace native species and crowd out native plant communities. As is the case with so many invasives, this alien has no known natural enemies, competitors or diseases in the environment to keep it in check. The Institute for the Study of Invasive Species states that "by interfering with ground covering plants, Nandina is able to alter an ecosystem and impact native animals that use native understory plants." In 2009, USDA Forest Service statisticians reported "in monoculture environments, Nandina establishes itself in high enough densities to block sunlight to native species in rich, diverse slope woodlands." And according to Texas Parks and Wildlife, "Nandina grows very aggressively forming monocultures. It out-competes native plant species in our region. This reduces the diversity of native plants in a given area which creates a lack of food and shelter available for wildlife." Mark Klym, author and Texas Parks and Wildlife Department (TPWD) Coordinator states that "many of our native plants have adapted specifically to accommodate the feeding habits of many native hummingbirds. Rampant infestations of Nandina interfere with the interdependent, symbiotic relationship which occurs between plants and wildlife, altering the infrastructure of our fragile ecosystem." In another TPWD study, field reporters concluded that Nandina displaces native plant communities with which native wildlife have evolved. It can smother or choke out native habitats and contribute to loss of native pollinators such as honey bees, moths and hummingbirds and the animals which rely on insect fauna that have been affected by these invasions. All parts of the Nandina plant are toxic. The plump, red berries are attractive but poisonous to birds, dogs, cats, some ruminant farm animals and wildlife. Excessive consumption of the berries is extremely toxic to migratory birds unfamiliar with this food source when found in their foraging flight paths. Lady Bird Johnson Wildflower Center (LBJ) describes Nandina as a "highly invasive weed that displaces non-toxic, native plants on which birds thrive and does more harm by actually poisoning native wildlife." According to another article referenced by LBJ Wildflower Center "when dozens of cedar waxwings were found dead in Georgia three years ago, investigators at the University of Georgia found the cause to be Nandina berries. Bird autopsies revealed the berries lodged in the birds' crops, as well as hemorrhaging of several internal organs. The root of the bird's distress is the cyanide and other alkaloids contained in the berries that produce highly toxic hydrogen cyanide, which is extremely poisonous to all animals. Sudden death may be the only sign of cyanide poisoning and death usually comes within minutes to an hour of exposure." "Over 220 bird species nationwide are in serious decline, including our most common birds. Birds are being killed on all fronts," states Jerry W. Davis, Certified Wildlife Biologist from Arkansas. The Native Plant Society of Texas warns that song birds are the first line of defense for pest control. Can we really afford to promote Nandina when we know it to be a serious threat to the birds on which we so depend? The USDA Forest Service reports that Nandina seedlings are the first plants noticed to emerge after prescribed fires. They suggest that some aspect of post- fire conditions actually promotes the germination of Nandina. Interestingly, they cannot confirm how long Nandina can live but individual plants found near home sites in the Southern U.S. were greater than 100 years old! While there is always substantiating evidence on both sides to promote one's cause or belief, I have been unable to find evidence supporting the propagation of this plant. Many scientific reports and frustrated gardeners' blogs later, all I come up with is "it was pretty with its red berries," "I thought I was doing the right thing to feed the wildlife," " I can't get rid of it," "it is taking over my property," "what can I do? Texas A & M AgriLife Extension confirms that invasive species are negatively impacting ecosystems and that it is costly. Their reports indicate that "it is very expensive to prevent, monitor and control the spread of invasives. The damage to crops, fisheries, forests, and other resources costs the US $137 billion annually. Some of the most harmful species cost in excess of $100 million annually." My first encounter with noxious Nandina occurred when I discovered it on a property I was working on in Shavano Park, San Antonio. A seemingly friendly looking evil-doer, planted close to the house by an unknowing homeowner, had spread into the woods. I found rigorous plants popping up everywhere, literally invading the beautiful native wooded habitat! It was impossible to completely follow the extensive, pervasive root system to eradicate it, even with the help of two men. Three days into the project we were still doing our best to just somehow manage the situation. Maybe that is what spurred this article. I can certainly testify to the seriousness of the situation, having attempted to deal with it personally. My research for this article only confirms my firsthand observations that this plant is systematically upsetting our fragile ecosystem, limiting natural biodiversity and messing with the natural balance of things. It is ubiquitous and appears to be unstoppable! It is interesting to note that the City of San Antonio's Appendix E Recommended Plants List does not include Nandina among its plants of choice to grow. And, while San Antonio Water System (SAWS) does include this plant in its recommended plant list, it states that Nandina is "very difficult to eradicate; avoid berry-producing varieties which have proven invasive in central Texas and the Southeastern U.S."
Apparently unaware of the risks, homeowners and landscapers are still planting this toxic, aggressive species. How can we halt this criminal? With facts in hand, passionately spread the word! Educate your friends and neighbors as to why invasive Nandina is not the plant of choice. Don't buy this stuff or plant it! Refuse to support big box stores and nurseries that sell it. Instead, plant a variety of friendly natives to replace lost habitat because diversity increases the chances that an animal can find food. Here are some excellent plant options: Flameleaf Sumac, Bush Germander, Texas Sage, Possum Haw Holly, American Beauty Berry, Salvia greggi, Yaupon Holly, Carolina Buckthorn, Barbados Cherry, or my favorites Agarita and its cousin, Texas Barberry. Homeowners determined to plant Nandina are encouraged to plant sterile, dwarf varieties such as Nana and Harbor Dwarf, which rarely set seed. Yet, because these varieties still spread profusely by rhizomatic action, it is recommended that dwarfs be kept in pots and monitored. Because Nandina is very difficult to remove manually, care must be taken when this invasive is potted as rhizomes escaping the bottom of the pot tend to "travel" quickly, with even the smallest piece of root re-sprouting! Didn't I see a Nandina's mug shot at the Post Office yesterday? Remove prior plantings and control sprouts and seedlings. Collect and bag or burn all fruit to prevent spreading. Pullerbear Tree and Root Puller makes an invasives weed remover tool which may help or just dig, dig, dig the roots by hand. Develop an on-going maintenance program to stay on top of re-growth and resident newcomers. Investigate chemical treatment options but with any chemical use follow the directions carefully and be aware that several chemical applications will be necessary with varying degrees of success. Please refer to LBJ Wildflower Center or The Institute for the Study of Invasive Species regarding chemical products targeted for invasives and their proper application. As scientists and researchers continue to search for answers to the "invasives dilemma," there are glimmers of hope. Dr. Kelly Lyons of Trinity University states "experimental studies suggest that more diverse vegetative communities are more resistant to new species introductions, in particular non-indigenous species invasions." Great news! And, in growing numbers throughout the state, groups of citizens are forming "Invaders of Texas" chapters. These grass roots chapters which are overseen by LBJ Wildflower Center, are committed to a three-pronged approach with regards to dealing with the invasives challenge. Through outreach programs, education and eradication, their mission is to inform the public of the seriousness of the situation and to actively work towards the control of the invasion of this species in our great state. We applaud these "citizen scientists," as they are called, and if you would like to support their efforts you may reach them at www.texasinvasives.org/invaders. Personal, firsthand experiences in the trenches!